Everyone with Greek citizenship is entitled to a Greek passport. It must be an e-passport or biometric passport with a microchip, which meets EU security guidelines on par with other countries of the world and allows passage through automated customs control now available at some international airports. Legislation signed within the EU framework says the microchip inside Greek passports held by citizens over the age of 12 must include digital fingerprints from the index finger of both hands as of August 19, 2010, to harmonize with Greece’s entry to the U.S. visa waiver program and a directive that requires all Schengen members to collect fingerprints as of June 29, 2009. It also stores the signature, image and personal data. Non-biometric Greek passports without the microchip are no longer valid for travel or ID purposes as of January 1, 2007. *Article last updated January 3, 2015, with a major update from a Greek citizen’s first-hand experience on June 21, 2014. However, answers in Comments reflect a specific case or whatever was true at the time. The Greek Ministry of Foreign Affairs plagiarized this article in August 2011 and sourced details from readers’ first-hand experiences for the English version of its official website, then distributed my work in May 2012 to Greek consulates/embassies around the world. The Greek embassy in the USA has reused my updates and refuses to give credit or write its own material. Only persons with Greek citizenship are eligible to get or renew a Greek passport. Marriage or simply having a Greek ancestor (mother, father, grandmother, grandfather, great grandparent) does not automatically grant you one. A passport is not transferable to another person. For example, if you have a Greek passport, your spouse does not automatically get a Greek passport or special privileges if (s)he does not have a Greek citizenship. See, “Spouses of Greek citizens” near the end of this article. It is the sixth most powerful passport in the world, granting visa-free entry to 167 countries, ranking behind the UK and Sweden (#1), Germany and United States (#2), Belgium and Netherlands (#3), Canada (#4) and Switzerland (#5). Whether it is a first-time application or renewal (which is technically issuance of new passport), the required documents and process for getting a Greek passport are essentially the same. In time, e-government services may streamline issuance. Renewals can start up to 12 months before a passport expires. *Requirements below reflect current documentation from police stations and real-life experience. Adults aged 18 and over: Must apply in person. Minors aged 12 to 17: Must apply in person, either accompanied by one (1) parent or be in possession of a dilosi signed by one (1) parent granting permission to issue a Greek passport. Minors aged 11 or under: Must apply in person accompanied by both (2) parents OR accompanied by (1) one parent and a dilosi granting permission to issue a Greek passport, signed by the (1) one parent not in attendance. Parents must also specify who will pick up the passport. The official website says that alternative arrangements can be made for elderly, sick or disabled persons under extenuating circumstances, assigning a representative via dilosi or requesting a consular or police officer to collect application, documents and signatures. However, in reality, this is not guaranteed and authorities refuse to accommodate special cases. There are 99 police stations ready to accept passport applications. Some will take walk-ins; some ask that you appear during certain hours with an appointment. The official website says you must apply in the municipality of permanent residence (not registration), though in reality many people I know applied at the station nearest their work or home and were not turned away. Amongst Greek citizens abroad who came to Greece to renew their passports to speed the process, some police stations were strict and asked them to prove a connection to the area (utility bill from grandfather’s residence, etc. ), while others were open to applications from anyone as long as citizens signed a statement/dilosi that they live abroad (monimos). *Hours may differ from what’s listed on the website. d) deliver passports to their rightful owners. Most locations require that you make an appointment. Also remember to inquire about accepted methods of payment for passport fees. — One (1) photo for Greek citizens aged 12 and over; two (2) photos for minors aged 11 and under. Note that at Greek consulate/embassies abroad, they sometimes ask for two or three because they keep one on file for tracking purposes. — White or neutral background, no shadows, and your mouth shut with an expression that is not smiling but not frowning. Women must show their face clearly with makeup applied modestly and hair pulled back. — There is usually someone to fix ‘red eyes’ and print the photo on high quality photo paper. *Knowledgeable photo places will know the required specs if you simply say, “for a Greek passport (yia diavatiria).” Different countries have different specs, which is why consulates/embassies sometimes have on-site photographers to ensure that photos will be done right. According to rules as written, what’s required depends on the applicant’s age and where he/she is applying. In reality, however, many Greek citizens report that they were asked to provide any combination of items listed below. Please don’t ask me which you’ll be asked for. It will vary greatly depending on who you are, where you apply and the person assisting you. b) Πιστοποιητικό οικογενειακής κατάστασης/pistopoiitiko oikogeneiakis katastasis (certificate of family situation) in cases where a Greek ID has not been issued, usually requested of Greek citizens abroad who do not have a Greek ID and cannot obtain one. — Can be obtained via a KEP Citizen Service Centre in Greece or direct from your οικογενειακή μερίδα/oikogeneiaki merida; Greek consulates/embassies sometimes offer assistance in requesting it from the relevant municipality, but not always. 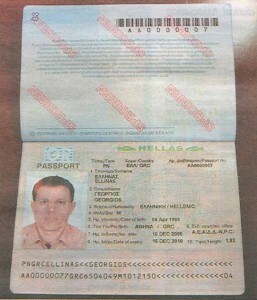 c) Πιστοποιητικό γέννησης/pistopoiitiko gennisis (Greek birth certificate) not older than six (6) months from date of application. a) One (1) original ληξιαρχική πράξη γέννησης/lixiarchiki praxi gennisis or pistopoiitiko gennisis (Greek birth certificate) not older than six (6) months from date of application. — Can also be requested via a KEP Citizen Service Centre or directly from your οικογενειακή μερίδα/oikogeneiaki merida or ληξιαρχείο/lixiarcheio (registry office); Greek consulates/embassies sometimes offer assistance, but not always. *As of 2011, many Greek police stations require Greek identity cards with Latin letters as part of stepped-up implementation of a 2009 law that says all citizens must swap. In Greece: Pay fees at any Greek tax office/eforia/DOY to get a παράβολο/parabolo (fee/deposit) receipt. An AFM is not required. Look for the tameio (cashier). Sometime in 2013, the Ministry of Finance intends to allow applicants to pay fees online via the TAXIS website (gsis.gr). I will update when it’s operational. Outside Greece: Pay fees at the Greek consulate/embassy, usually in euros or the euro conversion equivalent in local currency. Each location has different rules and payment methods, so check in advance. *Fees are refundable if a passport is not issued. — Authorities will enter your info directly into a computer determine if you need a red, black, green or blue application and provide you with one or complete the appropriate information on a computer, then print out a paper for applicants to check over and sign. — Staff in Greece speak Greek, and staff at Greek consulates/embassies worldwide may not speak a language other than Greek. You can bring someone to help translate. *Readers report that paper applications are no longer being used as of 2012. The official website presents passport application forms to download, which is evidence that their material is outdated and does not reflect reality. *Official website says all documents must have been issued in the past six (6) months from the date of application or be reissued. However, readers tell me that the Type B certificate or certificate of military service is a document without expiration date and can be used indefinitely as long as your status does not change. — If you have one but it’s lost, missing or stolen, you must present certified documentation attesting to this fact, such as a police report. — All citizens aged 12 and older must provide fingerprints from the index finger of both hands as of August 19, 2010, a requirement that complies with Schengen and the U.S. visa waiver program, which Greece entered in April 2010. — If you refuse to give your fingerprints, you cannot get a Greek passport. — Δεν έχει/εχώ καταδικαστεί τελεσίδικα για πλαστογραφία, πλαστογραφία πιστοποιητικών, υπεξαγωγή εγγράφων, ψευδή ανώμοτη κατάθεση ή ψευδή δήλωση, εφόσον τα αδικήματα αυτά αφορούν την έκδοση, τη χρήση ή την απώλεια ή κλοπή διαβατηρίου. — Δεν έχει/εχώ ασκηθεί σε βάρος του ποινική δίωξη ή έχει παραπεμφθεί σε δίκη για τα παραπάνω αδικήματα. — Δεν έχει/εχώ έχει κηρυχθεί ανυπότακτος ή λιποτάκτης. — Δεν έχει/εχώ εκκρεμεί σε βάρος του απαγόρευση εξόδου από τη χώρα. — I have not/have been indicted for forgeries, forging documents, making false statements under oath or false testimony that concern a passport’s issuance, use, loss or theft. — I have not/have been convicted or indicted by a jury for the above-mentioned offenses. — I have not/have been declared as a draft evader or deserter. — There is/is not an order that forbids me to leave the country. — I am not/am a holder of an old passport still in force. Stating the truth is important and does not automatically disqualify you from receiving a passport. — Dual Greek citizens who have a name different than the transliterated Latin name should provide a photocopy of a non-Greek passport, birth certificate, driver’s license or other official document specified by Greek authorities. Should you already be in possession of a valid Greek passport, you can choose to have it canceled on the spot if you do not need it, or cancel it after receiving your new passport. After documents are inspected and your file is deemed complete, you will be given a receipt that must be presented upon pickup by you, a legal guardian or a representative appointed by a dilosi or power of attorney that he/she has authorization to receive your passport. d) If police and passport authorities find something wrong with your photos or papers. In Greece: Most people report getting their passports within seven (7) working days or less. It can take longer in the months of July and August, when the majority of Greece goes on vacation. Outside Greece: Readers say that it can take anywhere from three (3) weeks to four (4) months. Passports for citizens abroad are supposed to be expedited because it is often their only form of identification, but Greece does not follow this protocol. There is nothing you can do to speed the process. Greece, its bureaucratic process and employees work at their own pace, which is why applicants are encouraged to think ahead; and Greeks abroad sometimes come to Greece to apply, then appoint a relative via dilosi to pick up the passport and send it by registered mail. If it was a renewal, your old passport should be canceled by police or consular authorities and returned according to the wishes you stated when applying for the new one. *I have seen cases where old passports are not canceled, but Greek authorities keep track in a database. Greece offers an urgent, one working day issuance of passports but only for emergency reasons having to do with injury, serious health concerns or death of an immediate relative. Temporary passports are typically issued to persons who had their passports lost or stolen, or for humanitarian reasons. What if my application and/or photos is/are rejected? If police find something wrong with your photos, or incomplete/mismatching information on your passport application, you will be notified of the reason for denial. You will be required to visit the police station or Greek consulate/embassy again and complete another application, resubmit one to three photos (depending on your age and whether you are in or outside Greece) and pay five (5) euros. Why? Because the receipt you were originally given pertains to the rejected file and the new file must be assigned a different protocol number. Latin names in Greek passports are typically transliterated from Greek, following a formula set by ELOT 743 that harmonizes with the International Standard (ISO 843). To see your Greek name transliterated to Latin, click “ELOT 743 Translator,” use the left column and enter your name in Greek. If your Latin name is wrong, you can inquire with a police station in Greece or a Greek consulate/embassy nearest your residence about changing it. They will ask for documentation specified in #9 of section ‘Documents and fees’ and charge a fee prorated to duration of remaining validity to reissue the passport. Γιάννης, followed by Ioannis OR John (taken from a comment on January 30, 2012). Following complaints from the Greek diaspora that they are being denied their legal right to specify alternate names to match official public documents, the Ministry of Citizen Protection says the law is mandatory and police, who are inconsistent in implementation, must respect the law. Where can Greek citizens go without a visa? The Ministry of Foreign Affairs has a table called “Visas for Greeks traveling abroad,” which details where Greek passport holders (diplomatic, service and ordinary Greek citizens) can travel without a visa. Germany and Greece have a reciprocal program that entitles Greek police officers at German airports to conduct random inspections, and German police officers at Greek airports to do the same as of March 2012, a measure to support in each other in minimizing illegal immigration. Greek citizens, however, cannot purchase property in Turkey (Ynet). Dual citizenship with another country would be a way around. Any previous unexpired U.S. visas are still honored by presenting the invalidated/old Greek passport bearing the original visa along with a biometric passport issued after August 26, 2006. There is no need to secure another visa. If you marry a Greek citizen, you are not automatically entitled to a Greek passport. Non-EU or EU husbands and wives of Greek citizens who are not Greek citizens themselves must first stake a claim to Greek citizenship if they are of Greek origin (descent) or go through the naturalization process to acquire Greek citizenship. A Greek passport is technically redundant for anyone who is already an EU citizen, though in reality there are cases when the “Greeks first” rule applies but lawfully should not — i.e., university housing, public sector employment. Those who already went through the process say ‘no.’ In fact, many who hired a lawyer to help with Greek citizenship and passports suffered significant delays from procrastination and paid exorbitant fees of 600-2000 euros. Seriously, that’s ridiculous. My experience over 14 years is to hire a lawyer, only if there is a threat of going to jail, to court or for highly complicated matters, such as property and inheritance. Getting a passport is a straightforward process that only requires patience and perseverance. a) This is Greece — If you followed instructions and provided the necessary documents, all you can do is wait. It is a ‘results may vary’ country, where two people applying under the same circumstances can have completely different experiences. b) How can you verify whether a lawyer achieved something you couldn’t have gotten on your own for free? — You can never know if a person has genuine influence or knowledge, until after you hire him/her and pay money that will not be refunded if proved otherwise. c) There are lawyers who take advantage of citizens abroad by claiming they specialize in Greek citizenship issues, overstate qualifications, use info from my website and charge exorbitant fees. If they’re writing articles and advertising on the Internet, how good could they be? The best attorneys are busy practicing law. If hiring a lawyer makes you feel better, that is a personal choice. My advice is to select one based on a referral or from an consular/embassy list, which gives you the right to complain should something go wrong. The only source available in 2007 was the Greek passport website, with the Greek version not matching reality and the English version poorly translated and barely readable. My May 2007 article was created with documentation received at the police station and the first-hand experiences of Greek citizens, then updated over the years with news articles, information from friends via email, and readers’ experiences shared in Comments. In August 2011, the Ministry of Foreign Affairs plagiarized this article in part for its passport page in English, reusing my translation and first-hand details I collected from Greek citizens. The info was then republished without permission by several Greek embassies and consulates, including London, UK; Toronto, Canada; Johannesburg, South Africa; and nearly all Greek missions in the United States. — Details via email from Greek-American (L.T. ), who applied for a Greek passport after being granted dual citizenship in 2013. Note to everyone — Some people have complained about having a difficult time getting a passport in Greece, however everyone I know had a very easy time and found the process straightforward and simple. My fiance mentioned that those who seemed to have trouble were those who didn’t/can’t follow instructions, which sounds a lot like my “Deksi Xeri, Sas Parakalo” story about people who couldn’t follow instructions at the U.S. Embassy either. Hi! I gave birth in Greece to a daughter (name deleted for privacy) on May 30, 2008. We have onomatodosia and she is registered in Peristeri where we live. I am a US citizen, married to a Greek, got permit here. My daughter has US passport. We also want to obtain EU/Greek passport type document for her. I was looking through your website for info/details but could not find anything. Did I miss something in your fantastic and detailed site? Could you refer me to a page where I can read in detail the paperwork needed to obtain such document? We’ll greatly appreciate. Enjoy the summer! Please read the article above. Thank you. Proof of working in the UK has absolutely nothing to do with getting a replacement Greek passport, so I have no idea why the Greek Embassy/Consulate would be requesting this. My instinct is that I do not know the whole story. Knowing/speaking Greek is not a requirement for obtaining Greek citizenship or a Greek passport if you are of Greek origin, which you are. All that’s needed to get a Greek passport is to prove you have Greek citizenship and go through the process I detail above at the Greek Embassy/Consulate. Привет! Посоветуйте как быть!) У меня мама имеет греческое гражданство, я гражданин Российской федерации.. Как я могу получить греческий паспорт? Заранее спасибо!!! Hi! My mother has Greek citizenship, I am citizen this way .. How can I get a Greek passport? Thanks in advance! It does not matter if your mother has Greek citizenship. If you want a Greek passport, you need to go through the process of acquiring Greek citizenship yourself, then go through the process I describe above to get your passport. The article is clear. I was curious, how is one’s Latin name/spelling determined on a Greek passport? Does one get to have some say or are there any rules regarding the “Latinization” of Greek names in this case? Thanks! My daughter was born in England and has a British passport but her father is Greek. Can he get a Greek passport issued without my consent? We were never married. Whether or not you were married, your daughter is entitled to Greek citizenship and a Greek passport through the father even though she was born outside Greece. However, as it says in the article above, a claim to Greek citizenship would first need to be filed on her behalf, then both parents/guardians must give consent for a Greek passport to be issued if she is aged 14 and under. still wondering why you think as many people think that the Greek passport is inferior to a French, German or Italian? Is it all in the brain, or is it legally Inferior, or do the French have more rights than the Greeks? Or is it just because we are so chaotic and messy that we are seen as less civilized? I state that a Greek passport is perceived to be inferior to other EU countries, and this is based on comparisons people make between which passports give them visa-free access or what they personally deem important (however subjective). Many hyphenated Greeks think Greek passports are inferior to Canadian, Australian or U.S. passports, which is why they don’t bother going through the bureaucracy, cost and trouble of getting a Greek one. They feel their current passport is easier to renew, plus it and a Greek ID does everything they need. My opinion is not stated. My great grandparents were born in Greece. My granny died recently, but we have her South African Birth Certificate & her parents actual/original passports. Do I qualify for a Greek passport? Does my mother qualify for one? If she does get approved, do I stand a chance of approval because she’s my mom? I don’t want to live in Greece, I just want a Greek passport for travelling purposes. As it says above in the article, you must apply and be granted Greek citizenship in order to qualify for a Greek passport; simply having an ancestor born in Greece is not enough. Your mother may qualify for one, but she would need to apply for her citizenship certificate using the instructions in “Greek citizenship by ancestry, descent or origin.” After your mother applies and is (hopefully) granted Greek citizenship and a Greek passport, it may make your application for citizenship and a passport somewhat easier. It is best to gather as many papers on the list I give and then consult the Greek embassy or consulate nearest you about how to proceed. In order to get a Greek passport, you must have Greek citizenship. Please read the article. I am a British resident and as far as I know I have a warrant for my arrest in Greece, for being questioned for an illegal financial act. My passport expires on January 2011 and I have to renew it soon. If I go to the Greek Embassy in London to apply for renewal is there any possibility to be arrested inside the Embassy and extradited to Greece?? Are they going to renew my passport??? In order to answer your questions, I consulted with both a lawyer and a trusted friend who is adept in consular/embassy affairs. However, please remember that this is a non-judgmental environment and our answer does not constitute legal advice. All three of us agree that it is highly unlikely your Greek passport will be renewed. When you apply, the application will be sent to Greek police for review and they’ll easily determine that there is an outstanding warrant for your arrest. The Greek Embassy in London is neither the sovereign territory of Greece, nor under the complete jurisdiction of the UK. That means you won’t be arrested inside the embassy, but Greek authorities will notify UK authorities of the outstanding warrant, request you be arrested and then extradited. If for some reason they cannot find or arrest you, they’ll simply revoke whatever privileges were officially granted to you by the UK and force you out of the country somehow. Unless you hold dual citizenship and a passport with another country, you will then be a man without legal residence or travel documents, since you cannot use your Greek ID to travel anywhere from the UK because the UK is not in Schengen. You’ll then have two choices: Surrender yourself at the Greek embassy, accept the travel documents authorizing your return to Greece and be arrested on Greek soil; or hire a Greek lawyer to negotiate your return. Given the current economic climate in Greece, I can assure you that there is a lot less tolerance for anyone committing financial crimes since you were last here. Thank you for your inquiry, and good luck. i have a very old-expired greek passport and i’m not sure if i can find it (propably not), should i report that i lost it, even though i’ve lost it for many years now? or can i make a new one? I am so so frustrated. I have been trying to get through to the Greek Embassy in London over the past four weeks – calling between 10 – 15 times a day and leaving voicmeail message after each attempt. Not once have I managed to speak to a human being. I need to renew my sons’ Greek passports. I have all the relevant paper work as requested on the website, all I need is an appointment. Should I just pitch up at the Embassy in Holland Park and refuse to leave until somebody assists me. This has to be the most unprofessional office I have ever had to deal with. Same goes for the Cape Town office. What is their problem???? I’ve heard and experienced first hand that service at Greek consulates and embassies worldwide varies greatly — some quite horrible, unhelpful and incompetent (if they answer the phone); and others quite efficient, friendly and knowledgeable. It’s a lot like public services here in Greece. I read the consulate’s instructions, and it does say an appointment is needed so I’m not sure what you can do if they don’t answer the phone. You could certainly go in person if it’s not a huge inconvenience, as they can’t turn you away if it’s done during posted opening hours. Just don’t be disappointed if all you get is an appointment. I empathize and wish you the best. Hello, my question is, I’m greek citizen and I applied for the new biometric passport at the consulate in Belgium, after 40 days my application form was rejected, so what is next? Do I have to go back to Greece or I can apply for the second time at the Greek consulate?